coffee, peace and justice for all. 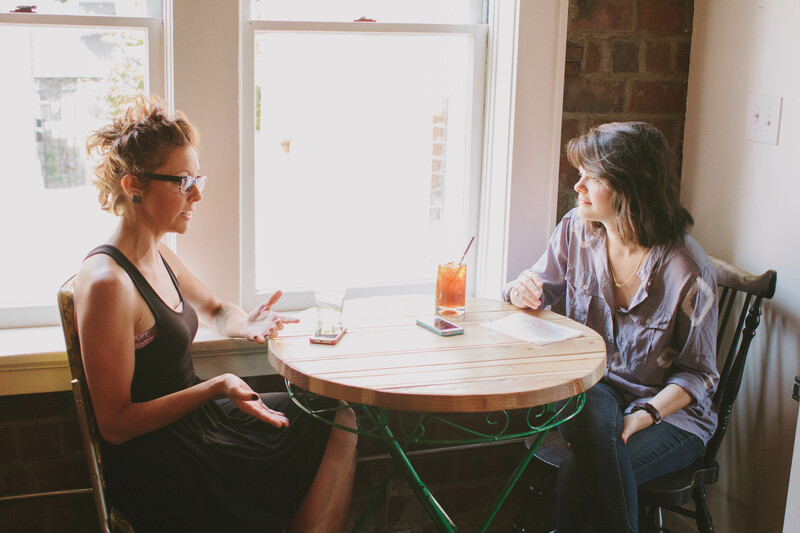 I sat down with Jessie Mueller to chat about her cozy spot on Manchester Ave.
Having opened a mere 10 months ago, Rise Coffee House has quickly become a community hub for The Grove neighborhood. Offering a place to work, meet, play, and relax, Rise’s inviting atmosphere is just that – inviting. 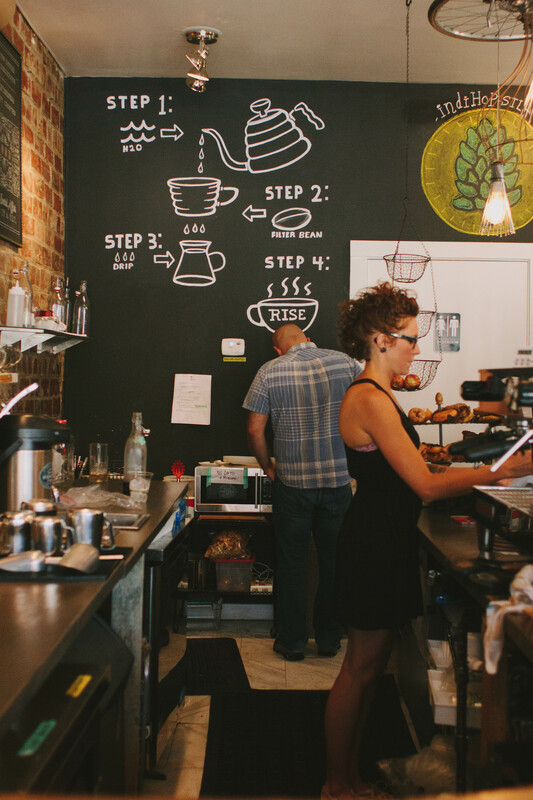 A large chalkboard wall explains the pour over process for the coffee novice while, in a whimsical fashion, literary pages exposed in old books hang from the ceiling upstairs. You can get your caffeine fix in a variety of ways – espresso, chemex, cappuccino, etc. – from roasters Blueprint Coffee and Goshen Coffee. For the snacking type, your drink can be paired with baked goods served at the counter from Whisk Bakeshop on Cherokee Street. 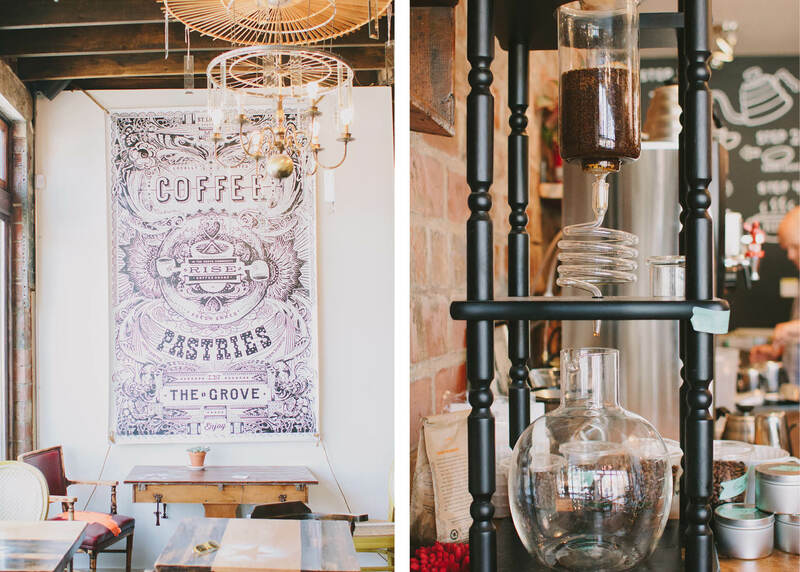 Owner Jessie Mueller set out to create a community anchor in The Grove as part of her love for The Grove renaissance, and Rise Coffee House was the product. Tell me how Rise Coffee House came to be. I was doing social work in the neighborhood and my boss at the time, who is actually responsible for a lot of the development of The Grove just kept talking about how the community needed an anchor and coffee houses tend to be that. 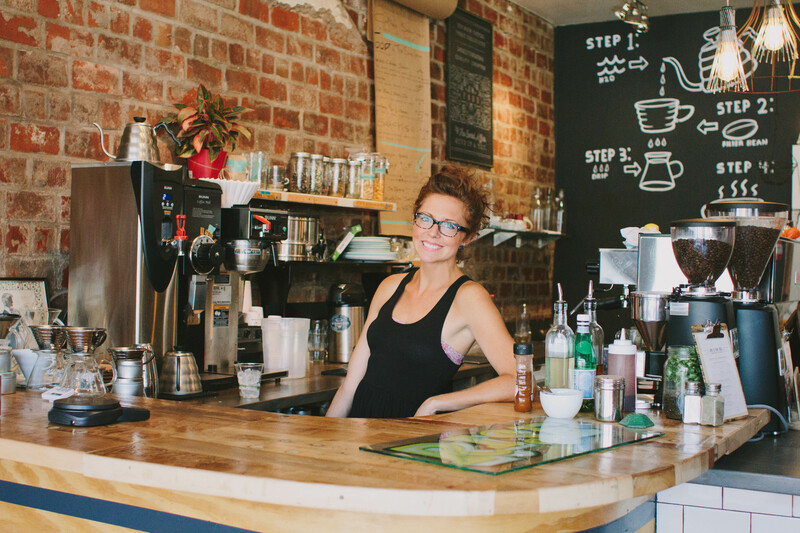 Once a coffee house is embedded in a community, the community really grows. 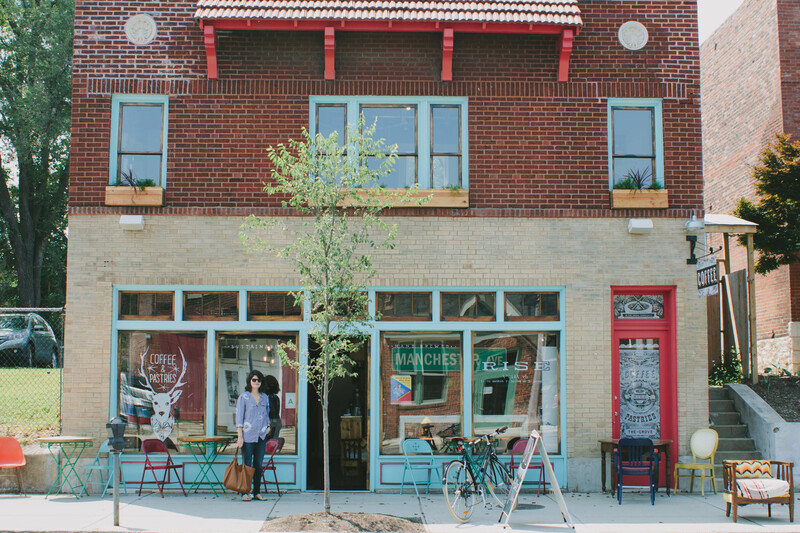 When people look to move into a neighborhood, they wonder what their local coffee shop will be. I came to the conclusion that I needed to go big or go home. I needed to get involved somehow or i’m just kind of going to piddle around in this and not really embed myself within a community. I was falling in love with The Grove renassaince, not just everybody moving in, but the people that were here already. My husband and I started looking at properties and came up with a concept. We went to portland and learned coffee culture out there a little bit. I had no coffee background whatsoever. I didn’t even know how to make a pour over at the time – for real. It’s been a really insane, eye-opening, sort of awakening. What has been the biggest hurdle in opening Rise? There have been so many. Honestly, learning coffee. And learning how to make connections with other people in the coffee world so that we’re a respectable coffee house. Also, trusting your gut – trusting that your ideas will work. That is the hurdle. You’re so vulnerable to judgement, you just have to push through that and trust what you see and what you envision. What is the best part of owning Rise? Every day is an adventure. Every single day is something new. Either a new challenge or something that somebody says to me that I wasn’t expecting that encourages me to keep just working at it and chipping away at the dream of it. Just recently we were featured on NPR for our partnership with Honey Masters, a group of teenagers in North City that started a honeybee farm. They just opened their storefront on the north side. They were huddled around a table one day when we first opened – I was just being friendly and chatting with them. They asked if I would have their honey at Rise and I said “yeah!” I was buying honey from Whole Foods and now Rise is the Honey Masters top wholesale account. That’s so exciting to me because it’s a group of teenagers from North City that are totally empowered. They are marketing their business, they have a bee farm, they are opening their own store, and have a model they hope to transfer to other cities. The spur of the moment experiences in which I get to help people while promoting my business and my dream are the best part. Where did the name Rise come from? We got the name Rise from a Martin Luther King, Jr. quote that talks about letting go of your individuality and embracing the common good. Tell me about Coffee for the People. Essentially you buy a coffee to pay it forward. 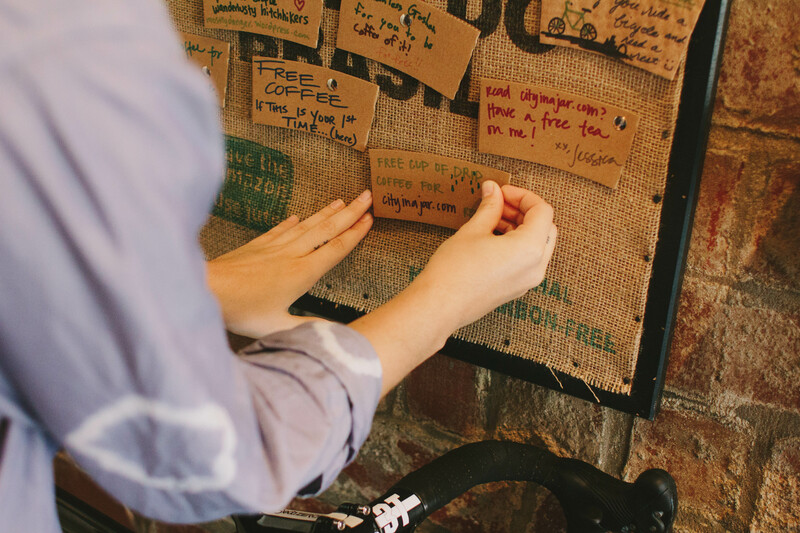 We give you a coffee sleeve to fill out, you decide who you want the coffee to be for and what it is, then tack it onto the Coffee for the People board. (A drip coffee for a City in a Jar reader!*). It’s a way to bridge a gap, so people can come in the door and know that there is coffee available to them, even if they can’t afford it that day. 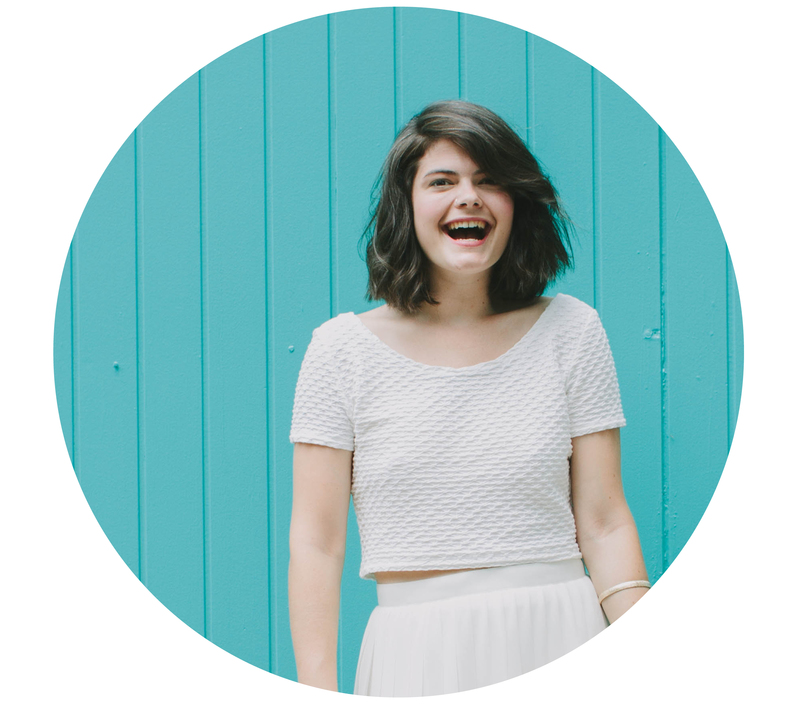 I just want everyone to feel they can use the space – that it is open and available. The idea is to foster community and diversity – everybody should pull coffee off the board. What is your favorite thing about The Grove? At first it started out as my freedom spot. I was a new mom and I would come out The Grove for a night of fun. Then I got an internship here and I had a purpose to come to The Grove for fun. Now it’s like home. I don’t live here, but I live here. I feel alive here. I come alive the minute I drive under The Grove sign. It’s still a freedom spot for me. What is your favorite coffee style? Gibraltar – also known as a cortado. Equal parts espresso and steamed milk. It does the trick. *While I was at Rise, I put a couple sleeves on the Coffee for the People board. Need a caffeine fix? Stop by Rise and enjoy a drink on City in a Jar. I need to check this place out! Love the green couch. Great article Jess! Love rise and I love the honey masters crew! This is beautiful! My husband and I totally love Rise Coffee. Great vibes in there. What a fun place! 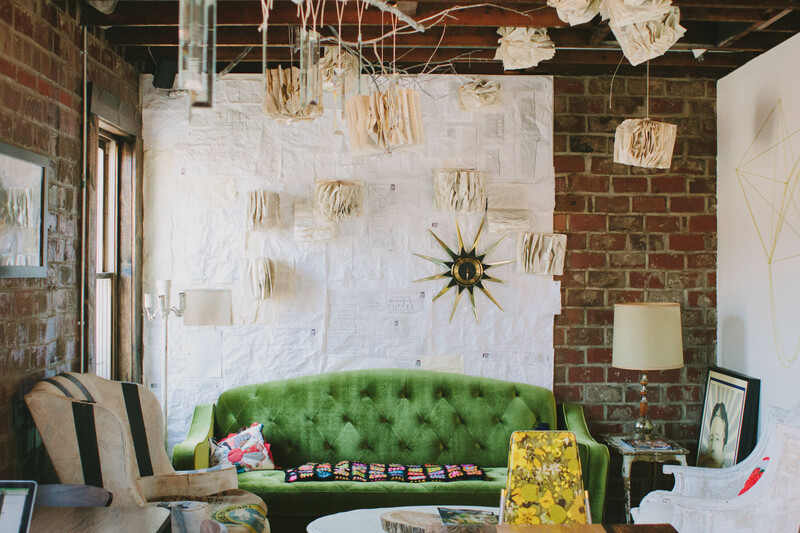 I want to sit on that green couch and read all morning. I love the Coffee for the People board too – so fun. I actually came by to invite you to come and join the Missouri Women Bloggers network. It is free to join. Our goal is to gather, grow, and connect MO bloggers to empower all of us. In the coming months we will be offering our members meetups, a conference, and compensated writing and blogging opportunities. You can Google Missouri Women Bloggers (or just click my name on this comment, which is linked) to find our website where you can learn more about us and join in.